Miner or Minor on Oak Island? DATELINE: Rick Lagina Always Finds Them ! The famine of discovery continued for the most part early on: the seismic mapping appears to be fraught with false positives. As usual, Rick Lagina puts a happy face on unhappy news that dry sand had been read as tunnels. There are no metal casings, only bedrock. So, the drilling comes up empty yet again. In the meantime, 95-year old Dan Blankenship made a rare appearance, remaining in the car as Rick took him down to the cove to see the new retaining wall being constructed. As one might expect, he is duly impressed at the new technology. This true figure of heroism remains our most favorite figure. Rick Lagina must have quite an international network of references when he does a stellar manhunt. Another interesting development is calling in a German geochemist to analyse the Templar Cross of lead. Tobias looks like a teenager but must be some kind of doctorate in the field. He can take the lead out of your worries. He knows when it was mined and where. He looks like a minor, not a miner expert. But Tobias is on the money from Germany on Skype. He brings the best news of the night’s episode. Once again we have been impressed with Gary Drayton who knows all too well what they find by giving it a cursory look. He found the Templar Cross and was on the money from the start. It appears that Templars may have come to Oak Island to hide their religious artefacts: and those may be too glorified to speculate upon. Oh, well, let’s shoot: it could be the Ark of the Covenant, or some suitable items from John the Baptist who was the Templar patron saint. They talk to another expert writer on the Templar secrets, but are fairly dismissive of her research. In the final analysis, this week’s discovery is so titanic that it makes all the waiting worthwhile. We feel closer than ever to some kind of revelation of Biblical proportions. History Channel has added another pilot for a series, using the usual formula, this time seeking the Ark of the Covenant through a Bible code. It is called God Code, just to be different. You may have seen a half-dozen documentaries over the years about some rabbis who discovered this code in the Torah. These were secret predictive messages found by counting an equidistant number of letters on a grid of quotes from the Bible. Now a man with no discernible credentials or degrees has written a book and called the Bible code by a revised name, God Code. He ignores the recognition of past discoveries and leaves the impression he is the first one to learn about the hidden codes. His name is Timothy Smith, which is about as far as you can get from rabbinical scholars. Oh, his brother is a cryptographer and his family owned a construction business that worked for presidents and senators. He never states he is a freemason. Well, he keeps wanting a perfect and early version of the Torah to make sure his bon mot predictions are mostly accurate. He starts by connecting one quote to the date of “September 11, 2001,” though the Bible attributes the terror to a Nazi organization (small matter, error ignored). Smith wants the original text, and learns it is hidden in the Ark of the Covenant, and the text tells him where it is. So, the show takes us to Israel where he learns that the Dead Sea Scrolls are unreliable, and the actual Temple of Solomon is not where everyone thinks. Not to disappoint conspiracy theorists, he blames the ubiquitous freemasons for not being forthcoming about what they know. He even visits an abandoned Masonic Lodge in Brooklyn for proof they know something. Hunh? He brings along a Jewish guy to help him with cultural morays in Jerusalem, but this is strictly a goyim operation. If you expect to find the Ark in the pilot, you are not a student of History Channel. Smith wants a series and will drop a code per week on those of us who stick with his cockamamie search. Reputable scholars are avoiding him. This is another anti-intellectual show where non-experts know all. Smith even suggests he is on a par with Sir Isaac Newton, but actually is smarter because he cracked the code. If you want cracks, we can provide them if this crap-shoot becomes a new series. A Twist on Oak Island: Templars in Tunnels? The 14th episode of Season 5 for Curse of Oak Island was both quite different and quite the same as many preceding weeks. You had a delay in the hunt for the treasure by giving the audience a nicely-wrought history of the Knights Templar. By piecing together snippets from previous seasons, the Lagina brothers show how they are coming to an inevitable conclusion. Whatever is buried on the island, it was from the Knights Templar and their crusading discoveries 1000 years ago. The Templars may indeed have come to Oak Island in Nova Scotia around 1300, after their persecution, to hide the artifacts of the Ark of the Covenant and Holy Grail. On top of that, the show continued to point out that the major hunters for the treasure were all Masons, part of an order that could have been the descendants of the Templars, with their zeal and secrets in full order. It made for a compelling foundation to indicate the treasure of Oak Island is related to hidden wealth of the Knights Templar. If we wanted a delay, this one was the most satisfying yet. History buffs had a night to confound and impress with the latest fifth season episodes of The Curse of Oak Island. Every wild theory found more evidence for its support and together all the most shocking hints combined to create a true treasure trove. Oh, there were the usual dead ends: finding a large square of earth that hinted at a treasure chest was immediately set upon by the hunters—only to reveal a big hole with nothing in it. The conclusion of the treasure seekers was that something was there once, but had been dug up and removed back in the distant past. They suggest it was black American expatriate Sam Ball who died in 1846 after becoming wealthy. Adding to the general weirdness was another historian who revealed that Sir Francis Drake might be buried on Oak Island in a metal coffin filled with preservative mercury. The remains of the privateer of the first Queen Elizabeth has never been found. Might the metal pieces discovered belong to his casket? On top of that, so to speak, is the shoe leather, later revealed through microscopic examination to be bookbinding. Did Drake’s close associate, Francis Bacon, bury secret and unknown Shakespearean manuscripts on Oak Island? That too is now in play. Two distinct and separate human bones discovered at 160 feet below the ground in the same place were from two different men: one European—and one from the Middle East, according to DNA. Middle Eastern body parts suggest Knights Templar and the long lost Ark of the Covenant—and perhaps other relics of the New Testament, which would alter history. All these weird details hint at a treasure trove of unmitigated mystery coming closer to solution and discovery. This leaves greedy sorts who want only gold of the Aztecs on the periphery of the treasure hunt. Of course, everything is in shards and tatters, perhaps destroyed by hunting techniques that have left them unprotected two hundred feet below the surface. We shall see if history is about to be upended. Someone buried something on Oak Island near Nova Scotia sometime between 1300 and 1795. For centuries treasure hunters have gone bonkers looking for it, spending time, wasting lives, and living adventure. Now a new reality series chronicles two brothers (Rick and Marty Lagina) who are spending their filthy millions, allegedly, to begin the quest again. 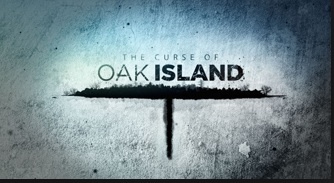 The series is called The Curse of Oak Island, in an attempt to spruce up a case that needs no window-dressing. This reality show is actually quite thrilling, historically fascinating, and quite compelling. The show manages to bring in ties to past quests: including the 90 year old Dan Blankenship and his son who searched for years to avail, and even Lee Lamb, sister of the Restalls (father and son) killed in a horrible accident at the Money Pit the 1960s in an effort to uncover the secret. The revelations are slow and methodical, and the Laginas are as guilty as any treasure seekers of the past in having hubris to spare. The series features moments in which coconut fibers found in the original Money Pit are carbon dated to 1300 or so. It is a genuine bizarre mystery to try to figure out why someone or some group (Knights Templar?) created elaborate booby traps and multiple oak log layers in a shaft going down several hundred feet. Our personal hope is that they find the Ark of the Covenant. Whatever was put there must have been considered priceless and special beyond all items in human history. Nothing good may come of this latest effort, but we are signed on till the bitter end. Read more movie/TV critiques in MOVIE MASHUP and MOVIES TO SEE–OR NOT TO SEE. All William Russo’s movie books are available on Amazon.com.